Reflections on learning at Lansdowne by past student and Public Education Ambassador, Bryher McKeown. For those of you who don’t know, my name is Bryher McKeown. I’m about to begin year 12 at Hobart College and I am fortunate enough to be an Ambassador for Public Education. My educational journey began at Lansdowne in 2005, I was a serious, excited and bossy 4 year old. Little did I know on that first day of school, the massive impact that the teachers, community and culture of Lansdowne Crescent would have on me, an impact that has guided the entirety of my educational pathway to this day. Throughout my 8 years at Lansdowne I learnt, grew and changed a lot. Lansdowne prepared and enabled me to take ownership over my own learning. And it was you, the incredible, hardworking and dedicated teachers that prepared me for the years to come, it was you who were kind, caring and attentive towards every students needs. It was you who acknowledged that education is so much more then whether you can add numbers or read. As while they’re important aspects of learning, you acknowledged the importance of life skills, of teaching assets like integrity, respect and kindness. You, the teachers of young children, who help the next generation achieve their best have been incredibly influential in my life. In years 2 and 3 I was fortunate to have consecutive years with Ms Thompson. We became particularly involved in the school Kitchen garden and for the first time I learnt to grow, nurture, harvest and cook fresh vegetables. It was particularly hilarious when we forgot about the potatoes we had planted and months later we found ourselves digging up hundreds of potatoes and distributing them around the school. This taught me about resourcefulness, sharing with other students and community. We also had a strong education focus on water and water conservation which really helped me gain a social conscience. I gained a love for maths in years 4 and 5 in Miss Pace’s class. During these two years I was fortunate enough to experience the benefits of a composite class allowing me to make new friends in the grade above mine. Miss Pace loved maths, a love which supported me to develop my own maths skills. My newfound love for maths dictated a lot of my subject choices to this day. In year 5, I was fortunate enough to be involved in Lansdowne’s very first Land to Sea Project, my peers and I developed and interpreted a walking trail around Knocklofty Reserve. I was also supported to travel to Melbourne for the Kids Teaching Kids Conference, where my friends and I ran and participated in workshops run by children from around the country. This helped me learn about not only sustainability but also the importance of peer led learning, I gained new knowledge from friends and began to pass it onto my peers. This meant that I retained the information easier and enabled me to take ownership over my own learning. While these last experiences came from a rather different angle, the crazy performances and fun days in 6 B/C with 6 W next door really shaped my attitude towards learning. These taught me how important it is to step out of your comfort zone, don a wig and sing incredibly out of tune, dress up in outrageous outfits. But most importantly this was done together, with my year 6 peers. My years cohort was relatively small, this meant that we gained the benefits of a conjoined classroom and we all became incredibly close. Which meant that despite the fact that the majority of my friends didn’t go to the same high school as me, we to this day are all very close. My Lansdowne peer group are still an active part in my social life even 5 years later. These few examples, and the hundreds of other incredible learning experiences and opportunities that Lansdowne gave me, have equipped me with the tools to approach school in a resilient and ever curious manner. After singing my way out of the year 6 leavers assembly and enjoying a long, hot summer, I began year 7 at Taroona High School in 2014. While High School ended up being the most amazing 4 years full of personal growth, finding new passions and leadership, the beginning was rough. Going from a grade of around 40 students to a year group of 270 is never going to be easy and while the first 3 terms of year 7 were a struggle as I tried to find my place in a massive grade, I believe my primary school experiences helped me over-come the large transition between Primary School and High School. But after finding my place at Taroona I began to thrive and I decided that in order to get the most out of my wonderful public education I’d get involved in a broad range of extra-curricular activities. I began to play the flute in Concert Band (and later the ear splitting piccolo), I joined a volleyball team and found my love for public speaking and debating , a love which defines a large proportion of my life today. When talking to current primary and high school students, my best advice is to get involve in what you love. Since finding my love for debating I have been to various state and National events, these include Tasmanian Youth Parliament, UN Youth and representing Tasmania at the National Schools Debating Championships. I can honestly say that I wouldn’t have been able to have these experiences if it weren’t for the incredible public schools that I have attended. It is teachers like you, who teach to the whole student and who inspire students to gain experiences, that encouraged me to get involved in out of school activities, that helped me gain the most out of my education. While my time at Lansdowne helped shape me into the person I am today and I wouldn’t have changed my Primary School education for the world, reading and learning about this wonderful school’s 2019 focus on Student led pedagogy and equipping students with tools for life makes me incredibly excited. I wish I could be a student once more to experience its positive effects first hand. But, I’m excited for the next group of students to grow as they move through primary school and on towards high school, I’m excited to see the wider impact that this incredible program has upon the Lansdowne Community, the parents, siblings and next generation of Lansdowne learners. Because I believe that it is student voice that helps us to achieve throughout education and beyond. When students stories and perspectives are known, it means that we can engage in making sure the content is tailored towards our needs, it means that our teachers can help us learn better and help us gain more than just the Australian Curriculum from school. Because the beauty of our Public Education System means that classrooms are diverse, they reflect the diversity of the real world which allows us to gain fundamental skills such as inclusivity and celebration of difference. It is this exact approach that my fantastic teachers took, throughout Primary School, High School and College, this exact approach that means that I can stand in front of you as the confident, relaxed and driven learner that I am today. December is always a crazy time in any school but also always a very special time. At our school it is when we take time to honour and farewell the leaving grade 6s. It’s a whole school affair at our place, our younger students loving being part of the celebrations, watching on their role models and heroes and waiting impatiently for when they get to be the big kids. Our grade 5s pay special tribute to the 6s through a drama/arts performance that recognises the 6s and wishes them well. Then the 6s themselves celebrate their primary school years through song – and the photo montage - and then more song and it is always uplifting and usually teary. The community stand to applaud the leavers and celebrate alongside them as they leave the GP room …. and leave grade 6. Each leaving grade 6 year group is special and each year we are proud of our leavers – what it exactly is that we are proud of changes slightly as determined by the group itself. Some years we might celebrate the strong positive culture within the group, or the clear determination to achieve, the love of learning, the collaborative nature, or the joy they feel in seeing one another succeed. This last characteristic – the joy in one another’s growth and achievement, has been a recurring story for our leaving 6s…each year the strong bonds they form around a collective love of learning is highly apparent. It is clear how much each year group is invested in the achievements of their peers – they genuinely love for each other to do well. Our 2018 leavers were no exception. 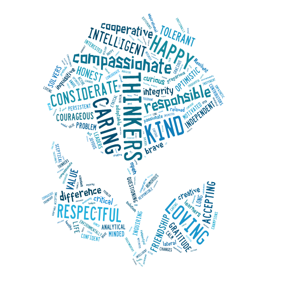 Each student personified our school values, demonstrated a genuine care for their peers and for their teachers –which was actually palpable -,showed a strong love of being at school and of learning, and were inclusive, empathetic, caring and kind. I would like to acknowledge the Grade 6 leavers. I first met this group when they were in Prep. They were very cute and a little bit crazy as all preps are. They provided me with a wonderful welcome to Lansdowne – I can still see their bright and smiling faces beaming up at me as I walked through the prep classrooms each day. Right from day 1 they impressed me with their beautiful social skills, their love of learning, their care of one another and their respect of all staff and grown-ups along with their high levels of empathy. They have welcomed new members to the grade each year and become very beautiful friends. They were an absolute pleasure to take on camp this year and I must say many of us will be teary when we bid them farewell. They will leave us feeling a huge sense of achievement as we know they live and breathe each of our values and they are each an embodiment of our vision – leaders of their own learning. I am proud of our grade 6 leavers and am very excited for them as they enter a new phase of education and learning. And I am proud of us – all of us in the Lansdowne community who influenced their education – teachers, school staff, community members and of course our wonderful parents and extended family members. Our collective focus on developing our students as highly confident and capable young people who have our core values deeply embedded, who love learning and who are just great people is evidently paying off – clearly seen in these young leavers. Goodluck class of 2018 - we wish you every success. What do we want the children we teach to be like as adults? ​This is the question we asked our whole school community in 2015, via facebook, the newsletter and through chats at the school gate. We asked our staff, families and other community members how they wanted their child to be as adults. If you look closely you see words such as: responsible, kind, brave, loving, grateful, courageous, problem solvers, and inquisitive, curious, creative thinkers. These words have given us a shared language and understanding about the purpose of schooling at Lansdowne. What we are here for is to develop children with these capabilities and dispositions. ​We continue to ask this question – seeking feedback from our students – evident in the video taken in 2017, our newer families and at community forums such as the one held in March of this year. As well, we are continuing our own learning in wellbeing, emotional and mental health and the skills needed for living and working in the future. The feedback continues to shape our thinking and direction. ​The latest iteration of our work can be seen on our website and is titled Assets of a Lansdowne Learner (ALL), aligning our work to our much loved motto – Respect for one and all. These assets are what we aspire for our students to develop at Lansdowne and to take further into their lives as adults. We use these assets as the backbone for our planning and consider the development of them as important as the development of literacy and numeracy skills and the content knowledge of learning disciplines. ​It influences the way we teach and has been the basis for our focus on developing a culture of inquiry (more on that in a future blog). Head over to our Assets of a Lansdowne Learner page and please join our conversation around this key question What do we want the children we teach to be like as adults?